Our great selection of unique handmade wedding anniversary cards are the perfect way to convey your best wishes to the couple who have reached another anniversary milestone. 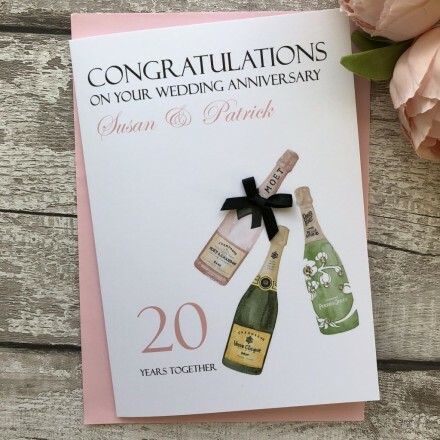 This lovely card is the ideal choice for a married couple to convey your very best wishes to or love to each other and features an image of Champagne bottles, a hand tied satin bow finishes this design. You can add any milestone to this card, making it perfect for the couple.